The story follows the life of low I.Q. Forrest Gump and his meeting with the love of his life Jenny. The film chronicles his accidental experiences with some of the most important people and events in America from the late 1950's through the 1970's including a meeting with Elvis Presley, JFK, Lyndon Johnson, Richard Nixon, fighting in Vietnam, etc. The problem is, he's too stupid to realize the significance of his actions. 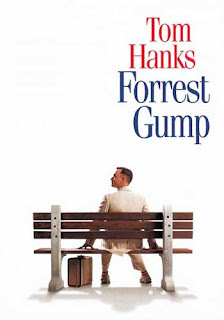 Forrest becomes representative of the baby boomer generation having walked through life blindly.